Knowing your market and preparing targeted keywords are the key to getting sales, and everything in these 6 videos hinges on this critical step. AffilioBlueprint Step 1 – Market Research and Keyword. Here below are an overview of these 6 videos. Video 1: Finding Profitable Digital Product Niches. 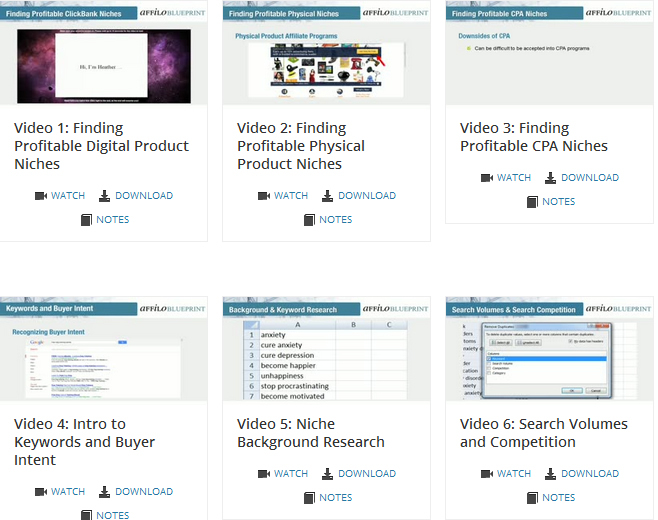 In this lesson you are taught how to find profitable digital product niches and products on Clickbank.You are also shown some basic niche keyword research to help you determine whether a niche is profitable. This finishes up with some common questions and homework. Video 2: Finding Profitable Physical Product Niches. In this video, you are taught how to find profitable physical product niches and products. This video starts by discussing why you should consider promoting physical products, what physical product affiliate programs there are, and then look at how to find hot niches. It brings out three solid reasons why you should promote physical products and how to profit from them big time. Video 3: Finding Profitable CPA Niches. In this video, you are taken step-by-step how to find profitable CPA niches. If you are confused as to what CPA is exactly, don’t worry, every detail is explained here. This video also looks at CPA niches with good longevity, which means there is high potential to profit over time. Finally, you will examine finding CPA offers with Offervault, and some useful tips for getting accepted into CPA networks. Video 4: Intro to Keywords and Buyer Intent. In this, and the next few videos, you are going to look at developing your keyword list. Keyword research is crucial for the success of your website. Spending extra time on really understanding how to choose good keywords can be the reason your site does really well. In this video you’re going to discover how to do niche background and basic seed keyword research. This is a very important lesson as you’ll be using your seed keywords from this video in the next video to create your final keyword list. To start, you are taught how to get inside the minds of your future buyers and master niche background research. You’ll also learn how to research seed keywords using a few different techniques, such as forum research, question and answer sites, and the “sales copy technique”. In this video you will be looking at finalizing your keyword list by expanding it, and then analyzing search volumes and competition. Then you’ll be shown how to eliminate duplicates and low volume keywords. Once that’s done, you’ll see how easy it is to analyze search competition. Finally, you will order and sort your keyword list to get ready for creating content. NB: This is just step one out of 12 steps, 6 videos out of 85+ downloadable videos. A lot has been put in this Affiliate Marketing training videos to give you what it takes to make big money online. The only one reason you will fail only is the fact that you fail to take necessary action. The necessary action here is to focus on something that works. Stop downloading useless ebooks, moving from site to site and looking for the quick button. It does not exist. You must focus and study how the things are done. This is the right place to start. What do you think about taking such an in-depth course? Have you gone through such affiliate marketing video course before? Thank you so much for making my day more enjoying and interesting. Few days back i read a nice article related to Affiliate marketing training named Affilorama. And today again you shared a nice information about Affiliobluprint. Affiliate marketing is one of the top methods to make money online, i was big fan of adsense because my brother made some grands from adsense but when i tried affiliate marketing the results were completely awesome. Even i have removed all the ads from my blog now and just focusing on affiliate marketing because it shows positive results. Thanks for sharing, need to check more about this course now! Enstine! Just checked the official. First thing is the content looks really awesome and seems like it would surely get some results. But I’m bit hesitant about the price. This article was made a special gift for me on this special day..moreover,i’m in a study about affiliate getting brand on my next web.. thanks for the stunning article enstine broo..
You really work smart, i must say. Previously when i landed on your webpage, i got aware of a new video downloader for mac and windows. You have provided a very useful info yet another time i landed on your page. This review is gonna work as a boon for many, as affiliate marketing is on boom and people are scratching web to learn more about it to make some money online. Good to see you around and thanks for the engagement. I try as much as possible to give out what I know will be helpful to my readers. Enstine, your failure note resonates with me. I saw success when I did as successes did, so sign up for this training, and rock it out! This is the Best affiliate post i had come across it had covered everything from Basics to Pro tricks and Tips for what and How to Affiliate marketing. Just checked out the course and the price is well worth it for all that information. Looks like a great way to get the proper training needed for affiliate marketers. I know some affiliate marketers that really need this one because they have no idea of the word “market.” Too many go about it the wrong way and then drop off because things did not work out. When it comes to marketing affiliate products one needs to follow a course and this looks like a winner to me! Yes, this course is one of the best in Affiliate marketing we have today. The price too is worth it. It’s not any rehashed book that tells you the same story. The videos are top, revealing real materials. Many bloggers still wrongly believe they will learn blogging with do-it-yourself approach. They don’t understand DIY won’t make them learn exactly and in limited time. For this they have to waste their lot of time in trial and error and after that they would fully learn all the aspects of blogging including Affiliate selling. The best way is to buy a premium tutorial or training course and learn it formally, accurately and in short time to apply it afterwards. No doubt pro bloggers of today have learnt most of the blogging by DIY but no one refers the amount of time they have spent for this. Not a single pro blogger of our times including you has been in this field for lesser than ten years. So these premium trainings and tutorials are a great blessing for the new lot of bloggers and they should not waste more time in worrying about its price or yearning for discount. They should grab such offers to become a successful online entrepreneur in shortest possible time. This premium training is what every struggling affiliate marketer should buy. It’s very complete and is sure to change someone’s life.